A day after issuing his controversial order to constitute a committee for recommending qualifications for journalists, Press Council Chairman Markandey Katju today widened the scope of the committee to enable the press watchdog to supervise and regulate journalism institutions in the country. Unfazed by the criticism of his decision on qualification for journalists, he issued a fresh order citing provisions in the Press Council Act that gives power to it to maintain and improve standards of journalism, including the power to supervise and regulate journalism institutions. 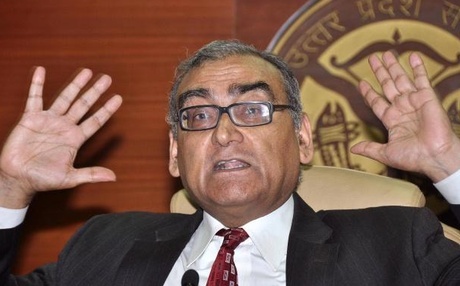 “Hence the Committee constituted by me yesterday shall in addition to its mandate…shall also recommend in what manner the Press Council can supervise and regulate the functioning of the institutions and departments of journalism in India so that high standards of imparting knowledge in journalism are maintained,” a statement issued by Katju said. He also added three more members to the panel — PCI members Gurinder Singh and Rajeev Ranjan Nag and IIMC Director General Sunit Tandon. Yesterday, he had appointed PCI members Shravan Garg and Rajeev Sabade and Dr Ujjwala Barve, Associate Professor, Department of Communication and Journalism, University of Pune as its members. Meanwhile, top editors found fault with Katju’s move describing it as a “silly” and “misconceived” step which “betrays” lack of understanding about the profession. The South Asia Media Commission also said the move for prescribing “by law” qualifications for journalists was “uncalled for and objectionable” and it has to be “abandoned without delay”. “It is a silly move and betrays a lack of understanding about journalism,” T N Ninan, Chairman and Director of Business Standard and Editors Guild President, told PTI. Rajya Sabha member H K Dua, who edited Hindustan Times, Times of India and The Tribune, said one cannot learn the qualities a journalist need like professional ethics and desire to serve society in a journalism school. “I don’t think Katju’s suggestion is good,” Dua said, adding that “country’s best journalists” like Frank Moraes, S Mungerkar, B G Verghese and Nikhil Chakraborty did not go to any journalism school. “Attending a journalism school does not make you a good journalist. You learn on the job,” Dua, who had gone to a journalism school, said. He also said that the comparison of a lawyer and a journalist was “totally wrong” as a lawyer needs special skill in law. “Journalism is vast spread out. In journalism you learn every day. The qualities a journalist needs like integrity, character, curiosity, desire to serve society, vast knowledge about society, courage cannot be taught in media schools,” he said. Vinod Mehta, Outlook’s Editorial Director, felt that the move was “completely misconceived” as a journalist do not require a qualification or a degree from a higher university. “There are best journalists who had just ordinary education. For a surgeon, you need special skills but for a journalist what you need is basic intelligence and ability to write. He (Katju) is completely wrong,” he said. Arindam Sengupta, Executive Editor of Times of India, also echoed similar views saying that Katju’s suggestion was “not practical”. “I don’t think it is the same as a lawyer needs a degree and a journalist should also have a degree,” he said. Siddharth Varadarajan, Editor of The Hindu, said he would be “wary of any suggestion” that seeks to prescribe a minimum qualification or to use a professional degree to regulate who can become a journalist. “The suggestion made by Justice Katju stems from his desire to ensure that we have better and more responsible journalism. This aim is laudable. But the setting of standards and ensuring their implementation is best left to editors,” he said. On comparison with lawyers and doctors, Varadarajan said journalism is a profession but its practice cannot be regulated the way medicine and the law are. “First, the evolution of new technology and social media means that the barriers between professional journalists and the general public have come down and that the number of people in the business of purveying information (news and views) is much larger than the universe of full time newspaper journalists. “So is everyone who blogs or tweets supposed to have a “minimum qualification”? Second, unlike medicine and law, the practice of journalism often involves speaking truth to power, and if those in power are to have the power to regulate who is a journalist and what is journalism, this is likely to compromise the freedom of the press. Finally, remedies already exist for the abuse of journalistic privilege,” he said. Chandan Mitra, Chief Editor of The Pioneer, described the move as “a joke”. “There is really no need. It is a job of anybody who is reasonably educated and who has a temperament for journalism. Training happens on the job,” he said. In its statement, South Asia Media Commission said, if such ideas are allowed to spread, the next step would be the demand for government regulation of media. “There are shining examples of persons without minimum qualifications distinguishing themselves in journalistic profession,” K K Katyal, SAMC president, said.